We are a folk-country duo and we have the chance to go on a little tour between England and Ireland from 19th to 24th april to present our music and our new cd «Make It Plain». 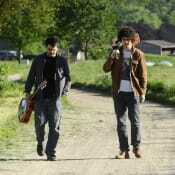 Make Plain is a folk-country duo from Ticino, Switzerland. 2013 was a very happy year for us, because we won two contests «Palco ai Giovani» and «Showtime» (RSI). 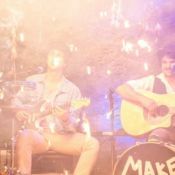 After that we finally recorded our first Album named «Make It Plain», containing 10 original tracks and one cover. The 15 march 2014 we passed the selection for the famous Gurten Festival where we’ll be playing in July. We have the chance to go on a little tour to Ireland and England, from 19th to 24th april 2014! We are going to start in Galway (Ireland) on 19 april 2014 where we’ll be live at «Sleepzone Hostel». Three days later we’re going to be in London where we’ll be playing in the streets and the metro stations. Finally we’ll be playing at «Troubadour Club» (23.04.14) a really famous venue known for having some of the biggest artists of the world, like Paul Simon, Jimi Hendrix and Bob Dylan. Our gigs will not be payed and we must pay the flight, accomodation and meals, and the instrument’s rental. So we’re asking you to support us to live and share our dream! This project ended successfully on 19/4/2014 17:00! You will get a autographed flyer with the «Make Plain» Logo. In addiction to the autographed flyer you get our CD «Make It Plain» with our special thanks for your support. You get an exclusive autographed DVD «Make Plain live in Chiasso» (not for sale). You get the exclusive autographed DVD «Make Plain live in Chiasso» (not for sale!) and a T-Shirt with the «Make Plain» Logo. You get the exclusive autographed DVD «Make Plain live in Chiasso» (not for sale), a T-Shirt with the «Make Plain» Logo and a video-message to thank you for your support. You get the chance to participate to a recording session of the new album of «Make Plain». A whole day including lunch. In addiction to have the chance to participate to a recording session of the new album of «Make Plain» (a whole day including lunch) you get a little photoshoot with the band in studio. You get an autographed CD «Make It Plain», the exclusive autographed DVD «Make Plain Live in Chiasso» and a V.I.P special pass that gives you free entry + backstage to every «Make Plain» concert in 2014 (Festivals excluded). You get a private show (only in Switzerland), an autographed CD «Make It Plain», the exclusive autographed DVD «Make Plain Live in Chiasso» and a V.I.P special pass that gives you free entry + backstage to every «Make Plain» concert in 2014 (Festivals excluded). «Make Plain», an English expression meaning «simplify», is this duo’s name. Luca and Andrea joined forces in September 2011. Their music philosophy and lifestyle converge, and the choice of expressing themselves through the simplest genre of country music, confirms their approach. Two guitars and a bass drum plus their own voices form the essence of their sound. GOS «Guitar Of Stone» è una Start-Up Ticinese che crea strumenti musicali utilizzando il granito Svizzero. I giovani artisti Ticinesi Make Plain hanno ormai raggiunto la loro maturità musicale. Grazie alla fusione del loro incredibile talento con le nuove tecnologie nel settore ingegneristico della GOS, sarà possibile garantire uno Show unico ed esclusivo ad ogni evento Svizzero ed Internazionale.